How Do I Choose a Bicycle Accident Attorney? How Much is My Bike Accident/Injury Case Worth? From 2010-2016, there were 6,824 bicycle crashes in San Diego County. Of these crashes, only 177 did not involve any type injury (property damage only). Numbers like these highlight the fact that cyclists are among the most vulnerable users of our roads. They can be difficult for drivers to see and are afforded very little protection when struck by motor vehicles. To keep cyclists safe, it is important to first know where they are at the highest risk of being struck and injured. The most dangerous intersection for cyclists is Midway Drive and Rosecrans Street in San Diego. Four of the ten most dangerous intersections were found in Escondido. Of the 50 most dangerous intersections: 30 were in San Diego, five in both Escondido and Chula Vista, four in Oceanside, three in Santee and one in each of Coronado, Encinitas and Solana Beach. Note: Fiesta Island had two locations that would have made this list. However, they were not true intersections. Rather they counted all 27 bike crashes on Fiesta Island Road. Therefore, we omitted them. Note: There were two ties for rank #9, three ties for rank #11, two ties for rank #22 and two ties for rank #38. Because of this, some of the proceeding numbers were omitted. Midway and Rosecran is one of the most traveled intersections in San Diego. It has multiple lanes traveling in each direction. It has several turning lanes going in multiple directions. Despite the high traffic volume, there are no bike lanes for bicyclists on Midway Drive. Of the 4 different directions that one can travel from this intersection, there are only bike lanes is both sides of Rosecrans. Unfortunately, those bikes lane are small, unprotected and not painted or delineated well from the vehicular traffic lanes. A close 2nd to the Rosecrans /Midway intersection on the bicycle risk score is the intersection at Rose Street and Valley Parkway in Escondido. This intersection is dangerous for many of the same reasons as the other dangerous intersections in this study. This intersection has no bike lanes of any kind for cyclists. In fact, there is no shoulder area to provide cyclist any type of room to navigate in this intersection. Based upon the results of the study, Escondido has some of the most dangerous intersections in San Diego. 4 of the top 10 most dangerous intersections in San Diego are in Escondido. The 4 intersections in Escondido within the top 10 most dangerous intersections are all fairly high traveled and provide little protection to bicyclists. 3 of the 4 Escondido intersections in the study have no bike lane or shoulder area for bicyclists. Only one of the Escondido intersections, Valley Parkway and Midway, has a bike lane but for only on one of the 4 directions of travel within the intersection. 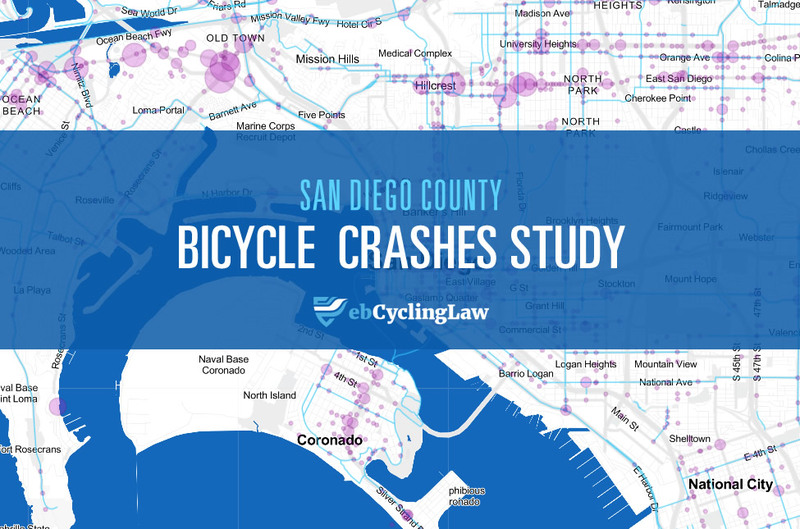 This map displays all bike collisions recorded in San Diego County from 2010 – 2016. Larger circle sizes indicate more crashes at that location. Areas with high concentrations of bicycle related crashes are outlined in pink. *Click and drag to move the map. Zoom in and out with mouse wheel or the buttons at the bottom left. At the city level, San Diego had far and away the most bicycle collisions, with 3,514. Due to the significant higher crash volume when compared with other cities in the county, the city of San Diego also had the most fatal (27), severe injury (196), visible injury (2,231) and complaint of pain (1050) crashes. *There were an additional 515 crashes in unincorporated areas of San Diego county. After identifying the most dangerous intersections, we found that there were several larger areas where high volumes of bike collisions occurred. These zones (which we have named in the table below for ease of identification purposes) are most often found in busy urban areas, such as downtown San Diego and Pacific Beach. These zones are highlighted in pink on the interactive map. Takeaways: How Can We Make San Diego’s Roads Safer For Cyclists? There are many common denominators in the most dangerous intersections from the study. First and foremost, these intersections are fairly highly traveled by vehicles and provide bicyclists little safety. Most of the intersections do not have bike lanes for a bicyclist. None of the dangerous intersections in the study have a protected bike lane for bicyclists despite the high number of injuries and accidents that occur to cyclists in those intersections. Additionally, none of the dangerous intersections listed in the study have a bike lane that is painted green. We know from prior studies done around the country that having a different colored bike lane is an inexpensive, yet highly effective in reducing bicycle accidents because it provides more delineation between the intended lanes of travel for bicyclists and automobiles. The high crash zone areas identified in the study share the same characteristics as the most dangerous intersections. The high crash zone’s contain a high volume of traffic and provide bicyclists little protection from motorized vehicles. Most of the high crash volumes have no bike lanes. None of the high crash zones for bicyclists contained protected bike lanes. We see more drivers distracted today due to cell phones. We are also seeing more bicyclists on the road utilizing dockless bikes. Therefore, unless more protected bike lanes are utilized in these dangerous intersections and high crash zones, we will continue to see bicycle crashes and injuries in these locations. Class 4 bikeways are recommended for the dangerous intersections and high crash zone areas. A class IV bikeway is a right-of-way designated exclusively for bicycle travel adjacent to a roadway which are separated from vehicular traffic. Types of separation include, but are not limited to, grade separation, flexible posts, inflexible physical barriers, or on-street parking. An Example of a Protected Bike Lane in Seattle, WA. Provide a linkage between regional trail systems. This study analyzed all crashes in San Diego County. Our next step is to isolate crashes that occur where bike lanes are present. This will allow us to identify areas that need bicycle infrastructure or that already have bike lanes but may need improvements. This study uses bicycle collision data from the California Highway Patrol for the years 2010-2016. Unfortunately, many records did not include accident coordinates. For those records, crash location data was generated using the primary and secondary road listed for each record. Kernel density estimation was used to create the danger zone polygons. Both intersections and zones were ranked according to the Cyclist Risk Score (CRS). This composite score takes crash volume and bicyclist injury severity (minor injury, visible injury, severe injury and fatality). The injury severity is noted when the crash is reported to the CHP, therefore there is no more information available about each specific injury. More information available upon request. Is it Illegal to Ride a Bike on a Sidewalk in CA? ESTEY & BOMBERGER, LLP © 2019. ALL RIGHTS RESERVED.